The influential Catholic Church in the Democratic Republic of Congo says there was a clear winner of Sunday's presidential election based on results it had seen. Bishops urged the authorities to be truthful and announce the results soon. The Church had thousands of election monitors and some had reported irregularities. The electoral commission said the announcement of the result, expected on Sunday, could be delayed. The head of the commission, Corneille Nangaa, said counting centres were still waiting for more than 80% of voting tallies to be submitted by local polling stations. The opposition has also complained of irregularities in the election to find a successor to President Joseph Kabila. He is stepping down after 17 years in office and has promised DR Congo's first orderly transfer of power since it gained independence from Belgium in 1960. The National Episcopal Conference of Congo (Cenco) did not say who it thought had won. The Church had been vocal in its opposition to the extension of President Kabila's rule. He was supposed to have stepped down in 2016. As the wait for outcome continues , the government has blocked the signal of a TV station owned by an opposition politician. Government spokesman Lambert Mende accused Canal Congo of declaring election results before the official announcement. This comes days after the internet was shut down nationwide. Canal Congo is owned by former rebel leader and acquitted war crimes suspect Jean Pierre-Bemba. He was barred from running for the presidency because of his conviction by the International Criminal Court (ICC) for bribing witnesses during his war crimes trial. He is backing businessman Martin Fayulu in the presidential race. Along with blocking Canal Congo, the authorities have also cut the broadcasts of Radio France Internationale (RFI) and withdrawn the accreditation of one of its journalists, Florence Morice, accusing her of violating electoral law. "We are not going to let a radio station throw petrol on the flames at a time when we are waiting for the compilation of the provisional results," Mr Mende told AFP news agency. RFI has denied the accusation and defended its journalist. Regional monitors - from the African Union and the Southern African Development Community - have described last Sunday's election as "reasonably well-managed". But the Roman Catholic Church's observer team reported more than 100 cases of election monitors being denied access to polling stations. 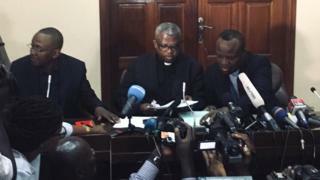 At a press conference in the capital, Kinshasa, spokesman Father Donatien Nshole said "data in its possession from vote counting reports from polling stations designates the selection of one candidate as president". He called on officials "to publish the election results in keeping with truth and justice".